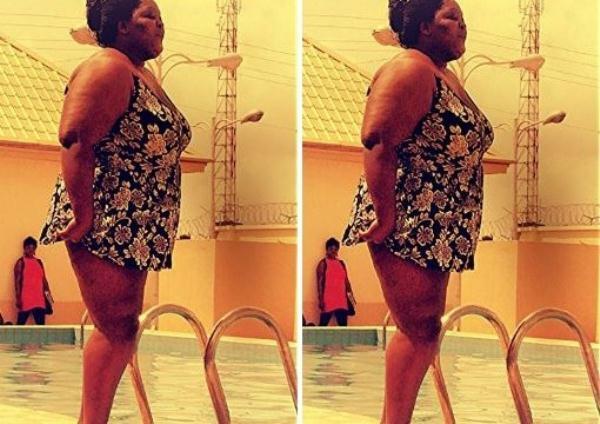 Read excerpts from recent interview with Eniola about her pool bikini pictures…. Excerpts:You must have been very courageous to have dared to wear a bikini recently. I don’t like all these questions that bother on my size. Abi am the biggest person in the world? Were they expecting me to wear a night wear like am wearing now to the pool? Na wa for Nigerians sef. I wore what was appropriate and still they are making funny comments. I didn’t even wear a bikini and yet they won’t stop talking. You don’t favour your critics? The moment they try to sound negative you take them to the cleaners. Do you get furious easily? No I don’t. It’s just that I don’t tolerate intimidation from anyone. In other parts of the world people commit suicide at times because of intimidation. When you allow yourself to be intimidated then depression comes in and when depression comes you want to harm yourself. So for that reason I don’t allow anybody to intimidate me or intimidate anyone around me. I just don’t like it. I hate negative vibes. If I have a friend and she tries to sound negative I keep a distance. I want happy people around me. But to answer your question, in recent times, I have engaged my critics for making my business theirs. I am not the biggest person in the world now or am I? I don’t know why they keep commenting on my size. We all can’t be slim and I like me just the way I am so they should please leave me the hell alone. I am séxier than some slim people. I mean I’m surprised that people can make it an issue. But in all honesty, is a weight reduction programme an option for you? No, already I exercise to keep fit and I am fit the way I am. I have said it before and I will say it again, I am healthier than a lot of slim people. But that is not to say I don’t exercise. I do. In fact, I love swimming. Even, if your man says so? No I can’t lose weight for any man. Any man who doesn’t like me the way I am can as well keep a distance. Why must I even lose weight for a man? What if I lose weight and I find someone else and he says I want you to add weight for me then I will add weight again for the person. It doesn’t make any sense. Everybody can’t like you so if you don’t like me just stay away. Any plans for a plus-size foundation? No, but if I must do anything for the plus-size, it has to be clothing the plus-size. I am a very trendy and up to date babe. I have that urge to cloth the plus-size because it’s what I’m good at. If you are a plus-size and you have a problem putting your wardrobe together you can contact me and I will do a good job on that. I know what fits and what’s trendy at the same time.